How Do I Know Whether My Car is OBD-II Compliant? This entry was posted on January 26, 2004 by ScanTool.net Team. **Please Note: OBD-II compatibility is not related to where the vehicle is manufactured where your vehicle was bought when new. 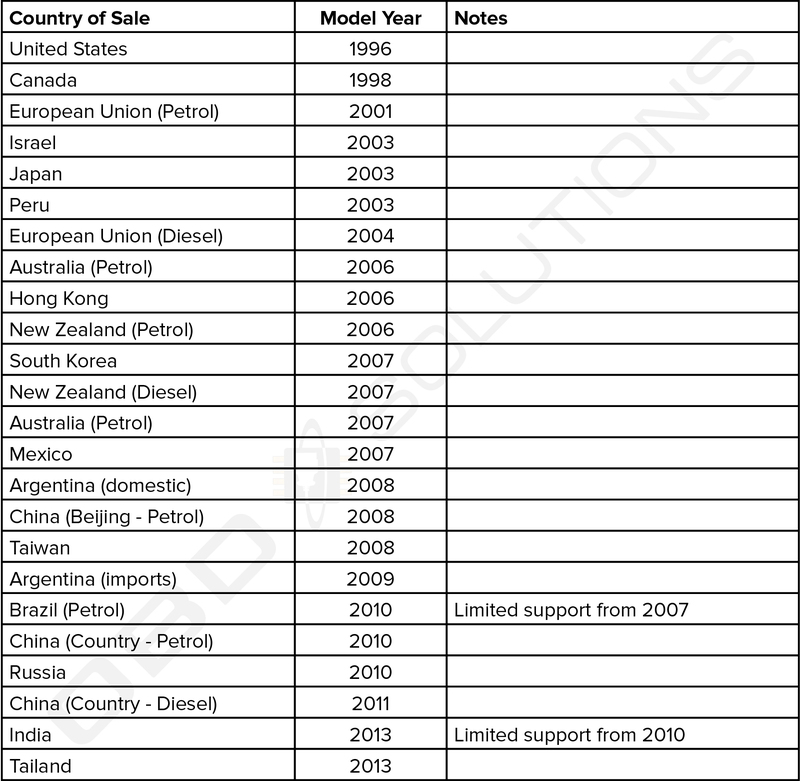 To read the chart below, choose the country where your vehicle was sold new. If you do not see the country below, check your vehicle manual, research online, or consult with your dealership to confirm OBD-II compatibility. **Please Note: Hybrid and Electric vehicles are low or zero emission vehicles, our scan tools may not work. Check your vehicle manual, research online, or consult with your dealership. Note that here "European Union" means countries which were members of the EU in 2000. Note that here "European Union" means countries which were members of the EU in 2003. If your vehicle does not fall into any of the above categories, look under the hood and try to locate a label (Fig. 1) that explicitly states that the vehicle was designed to comply with OBD-II legislation. You may also consult your vehicle's owner's manual and perhaps contact your local dealer. However, be aware of the fact that many dealers do not know the difference between OBD and OBD-II. If the vehicle is not OBD-II compliant, you cannot use a generic OBD-II scan tool such as ElmScan to obtain diagnostic information from your vehicle. But my car has the 16-pin OBD connector, shouldn't it be OBD-II compliant? No, not necessarily. A lot of European and Asian manufacturers equipped their vehicles with D-shaped 16-pin connectors long before they began installing OBD-II systems on those vehicles. One curious thing to note here is the fact that most non-EOBD compliant vehicles had a DLC that does not fully conform to SAE J1979. Compare figures 2 and 3, and notice the "ears" on the non-EOBD compliant Ford Focus.